本发明公开了一种清热解毒利湿止痒的中药湿巾的制备方法，它是由黄柏、苦参、金银花、土茯苓、地肤子、紫草作为主要原料，按常规制剂工艺制备成的中药湿巾。 The present invention discloses a method for preparing a medicine detoxification dampness itching wipes, which is a cork, Sophora, honeysuckle, Smilax glabra, Kochia scoparia, comfrey as a main raw material, prepared by a conventional preparation process into Chinese wipes. 有清热解毒、利湿止痒的功能，具有无痛苦、易接受、疗效显著、不易过敏的特点，它采用地方上较为多见的中药材作为原料，成本低廉，治疗效果显著。 Detoxification, dampness itching function, with no pain, easy to accept significant effect, hypoallergenic characteristics, it is more common to use local medicines as a starting material, low cost, significant treatment effect. 本发明涉及中医中药领域，特别是一种清热解毒利湿止痒的中药湿巾的制备方法。  The present invention relates to the field of Chinese medicine, especially the method for producing a medicine detoxification dampness itching wipes. 特应性皮炎是一个与遗传相关的慢性皮肤病，主要特点就是皮肤的瘙痒，慢性复发性同时伴有其他过敏性疾病的皮肤病。  Atopic dermatitis is a chronic skin disease associated with genetic, main characteristic is itching, chronic recurrent skin disease of the skin accompanied by other allergic diseases. 特应性皮炎的临床表现形式很多，根据皮疹发生、发展和分布特点，可将其分为婴儿期、儿童期和青少年成人期三个阶段。 The clinical manifestations of atopic dermatitis lot, according to a rash, development and distribution, can be divided into infancy, childhood and adolescence adulthood in three stages. 特应性皮炎发病于2岁以内的称为婴儿期，主要表现为婴儿湿疹，皮损主要发生在两颊、额头及头皮、颈部。 The incidence of atopic dermatitis in infancy called within 2 years, mainly for baby eczema, skin lesions mainly in the cheeks, forehead and scalp, and neck. 皮损主要表现为渗出型和干燥型两种皮疹，并前者在临床上更为多见。 Exudative lesions mainly two kinds of rashes and dry, and the former is more common in clinical practice. 很多患儿出生几个月以后出现皮疹，典型表现为皮肤瘙痒并伴随红斑，红斑上有密集的水泡和针尖状丘疹。 Rash, typical performance of many children with skin erythema accompanied by itching and a few months after birth, dense needle-like blisters and pimples on erythema. 在婴儿期发病的时候有时也会被叫做婴儿湿疹或者老百姓所讲的奶癣。 Onset in infancy, when sometimes called baby milk ringworm eczema or people are talking about. 儿童期是指2-12岁的患儿，大多由婴儿期演变而来，儿童期头皮层可能比原来好一点。 Childhood refers to children aged 2-12, mostly from infancy by the evolution of childhood head cortex may be a little better than the original. 皮损主要表现为湿疹型和痒疹型，典型的发病部位在肘前窝、胭窝、腕屈侧、眼睑、面部和颈部。 Lesions mainly as eczema and prurigo type, the typical anatomical site in antecubital fossa, popliteal fossa, wrist flexor side, eyelids, face and neck. 这个时期最主要的症状为瘙痒剧烈，因此皮损上可见大量抓痕继而感染，以致形成“瘙痒-搔抓-瘙痒”的恶性循环。 The main symptom is intense itching of this period, and therefore a large number of scratches visible lesions on infected turn, so as to form "itching - scratching - itching" the vicious circle. 夏季皮炎又名夏令皮炎，是夏天的多发病、常见病，系因持续的高温、高湿度的外环境，加上皮肤出汗多又没有及时清洗所致的皮肤炎症。  summer daylight saving dermatitis, also known as dermatitis, it is a summer disease, common diseases, was due to sustained high temperatures, high humidity outside environment, coupled with the skin sweat and no time to clean the skin caused by inflammation. 其典型症状为发生于四肢伸侧，尤其是两小腿的前方，对称发病。 Typical symptoms occurred extensor extremities, especially the two front legs, symmetric incidence. 初起为粟米大小、比较密集的红斑、丘疹或丘疹水疱，瘙痒明显，并伴有灼热感。 The beginning of the corn size, more intensive erythema, papules, pimples or blisters, itching obvious, accompanied by burning sensation. 由于奇痒难忍而搔抓，常出现多条条状抓痕、血痂，消退后会留下色素沉着。 Because itchy and scratching, scratches often appear multiple strips, blood scab, leaving pigmentation will fade. 夏季皮炎如果范围较大或患者有剧痒，可在薄涂外用药的基础上，同时口服抗组胺药。 If the range is large in summer dermatitis patient or itching, it may be based on a thin coating for external use, and oral antihistamines. 服用抗组胺药物存在较多不良反应，且治疗不彻底，容易复发。 Taking antihistamines there are more adverse reactions, and the treatment is not complete, easy to relapse. 以上各种皮肤病在治疗过程中，不管是中药还是西药均出现不同疗效，大大减轻了病人的痛苦，不足之处是不能从根本上治愈，易复发。  All of the above skin diseases in the course of treatment, whether it is Chinese or Western medicine there are different effect, greatly reducing the suffering of patients, deficiency is not a cure fundamentally, easy to relapse. 针对上述特应性皮炎和夏季皮炎，通过中医治疗，毒副作用较轻，不易复发，更容易受到广大患者朋友的青睐。  In response to these atopic dermatitis and dermatitis summer, through Chinese medicine treatment, mild side effects, less recurrence, the majority of patients are more susceptible to friends of all ages. 公开号CN 101152313A (申请号200710132783.9)的中国专利文献公开了一种治疗夏季皮炎的中药，其组成为:六一散18克，黄柏、苍术、陈皮各20克，地肤子15克，苦参10克，白鲜皮15克；辅助方剂:伴见身热汗出、心烦口渴、小便短赤、舌红苔黄腻、脉滑数者，加牡丹皮、地榆、马齿苋各18克；兼见胸闷脘胀、溲赤便溏、舌淡苔白或白腻、脉濡数者，加藿香、佩兰、半夏、茯苓各15克。 Publication No. CN 101152313A (Application No. 200710132783.9) of Chinese medicine patent discloses a method of treating dermatitis in summer, consisting of: six a casual 18 g, Cork, herb, dried tangerine peel 20 grams, 15 grams Kochia, Sophora 10 grams, 15 grams Dictamni; auxiliary prescription: see fever with sweating, thirst upset, urine short red, red tongue yellow greasy number, plus moutan, Burnet, 18 each purslane g; see chest and abdominal swelling, urinate loose stools, pale tongue, white or greasy, pulse number, plus rugosa, Perrin, Pinellia, Poria 15 grams. 它声称该中药剂材料易取，配方及制备方法简单，制备药物费用低廉。 It claimed that the material is easy to take the drug, formulation and preparation method is simple and inexpensive preparation of drug costs. 公开号CN 101983650A (申请号201010503623.2)的中国专利文献公开了一种治疗夏季皮炎的药剂，其具体配比在于:黄柏6克、苍术6克、荆芥6克、蛇床子9克、防风6克、明矾3克。 Publication No. CN 101983650A (Application No. 201010503623.2) Chinese patent discloses a method of treating summer dermatitis agent, wherein the specific ratio: Cork 6 g, 6 g herb, Nepeta 6 grams, Cnidium 9 grams, 6 grams of wind alum 3 grams. 它声称该种治疗夏季皮炎的药剂清热解毒止痒，药效显著、安全有效，无任何毒副作用。 It claims that such treatment of summer dermatitis drug detoxification itching, significant efficacy, safe and effective, without any side effects. 公开号CN 102526284 A (申请号201210005596.5)的中国专利文献公开了一种具有消炎、止痒、杀菌作用的凝胶剂，其成分组成为:金银花(山银花)15g、地肤子8g、黄芪10g、紫草2g、白鲜皮12g、薄荷2g、冰片0.01g、蝉蜕2g、滑石12g、甘草2g、蜂蜜0.5g、丙二醇20g、卡波姆14g、三乙醇胺10ml、甘油20g、山梨酸2g。 Publication No. CN 102526284 A (Application No. 201210005596.5) of Chinese patent discloses an anti-inflammatory, antipruritic, bactericidal action gelling agent, which is component composition: honeysuckle (Lonicera confusa) 15g, Kochia scoparia 8g, Astragalus 10g, Lithospermum 2g, fresh white skin 12g, mint 2g, borneol 0.01g, cicada 2g, talc 12g, licorice 2g, honey 0.5g, propylene glycol 20g, carbomer 14g, triethanolamine 10ml, glycerin 20g, sorbic acid 2g. 它声称该凝胶剂可以有效发挥疏风清热，凉血解毒，除湿止痒，涤秽养肤的功能，尤其适用于小儿瘙痒性皮肤病，如儿童丘疹性荨麻疹、痱子、夏季皮炎、尿布皮炎、湿疹等。 It claims that the gel can effectively play dispersing heat, cooling blood detoxification, dehumidification itching, wash dirty moistening function, especially for children with itchy skin, such as children papular urticaria, prickly heat, summer dermatitis, diapers dermatitis, eczema and so on. 以上中国专利文献都公开了一种治疗夏季皮炎的中药，它们在治疗夏季皮炎上或多或少都取得了一定疗效，但多因为中药见效慢的特点需长期服用，俗话说:“是药三分毒”，长期服用或多或少的会给患者的脾胃、肝肾造成一定的毒副作用。  more Chinese patent literature discloses a traditional Chinese medicine for treating summer dermatitis, and they more or less have achieved a certain effect in the treatment of dermatitis summer, but more because of the characteristics of slow effect of traditional Chinese medicine to be long-term use, the saying goes: " three-drug ", more or less long-term use will give patients the stomach, liver and kidney cause some side effects. 为了克服现有技术的不足，本发明的目的是提供一种疗效显著、清热解毒、利湿止痒的治疗特应性皮炎和夏季皮炎的中药湿巾的制备方法。  In order to overcome the deficiencies of the prior art, an object of the present invention is to provide a significant effect, preparation detoxification, therapeutic dampness itching dermatitis and atopic dermatitis medicine summer wipes. 将各原料洗净混合，添加原料重量25~30倍的水，浸泡40_90min，用武火煮开锅，改用文火，保持微沸状态煎煮20-40分钟，滤渣，将消毒无纺布置滤液中，浸溃，得成品湿巾。  Wash mixing the raw material, 25 to 30 times the weight of the feed water, soaking 40_90min, the use of force Simmer boil, switch to a slow boil kept boiling state for 20-40 minutes, residues, disinfecting nonwoven fabric home filtrate, dipping to obtain finished wipes. 地肤子15~45份 紫草15~45份。  15 to 45 parts Fructus Zicao 15 to 45 parts. 地肤子20~40份 紫草20~40份。  20 to 40 parts Fructus comfrey 20 to 40 parts. 地肤子30份 紫草30份。  30 parts of Fructus Lithospermum 30 parts. 前面所述的制备方法，优选的方案在于:用水量是原料总重的26-28倍(优选27倍)。  The method of preparation previously described, a preferred embodiment is that: water is 26-28 times (preferably 27 times) the total weight of the feedstock. 前面所述的制备方法，优选的方案在于:浸泡的时间是50-70分钟(优选60分钟)。  The production method according to the foregoing preferred embodiment wherein: soaking time of 50 to 70 minutes (preferably 60 minutes). 前面所述的制备方法，优选的方案在于:保持微沸状态煎煮的时间是25-35分钟(优选30分钟)。  The method of preparation previously described, a preferred embodiment in that: the state of holding the micro-boiling boiling time is 25-35 minutes (preferably 30 minutes). 前面所述的制备方法，优选的方案在于:所述湿巾规格为18.5cmX 18.5cm。  The production method according to the foregoing preferred embodiment wherein: the wipes specifications 18.5cmX 18.5cm. 黄柏，性味:苦，寒。  Cork, taste: bitter, cold. 归经:归肾、膀胱经。 Meridian: kidney, bladder. 功效:清热燥湿，泻火除蒸，解毒疗疮。 Efficacy: heat dampness, purging fire addition to steam, detoxification treatment and sore. 主治:用于湿热泻痢，黄疸，带下，热淋，脚气，痿甓，骨蒸劳热，盗汗，遗精，疮疡肿毒，湿疹瘙痒。 Indications: For hot and humid dysentery, jaundice, vaginal discharge, hot shower, athlete's foot, atrophy glazed tile, Gu Zheng labor hot, night sweats, nocturnal emission, sore swollen poison, eczema itching. 金银花，性味:甘，寒。  honeysuckle, of taste: sweet, cold. 归经:归肺、心、胃经。 Meridian: lung, heart and stomach. 功效:清热解毒，凉散风热。 Effect: detoxify, cool wind-heat powder. 主治:用于痈肿疔疮，喉痹，丹毒，热毒血痢，风热感冒，温病发热。 Indications: For carbuncle swollen boils, pharyngitis, erysipelas, dysentery Noxious Heat, Fengreganmao, febrile disease fever. 苦参，性味:苦，寒。  Sophora, taste: bitter, cold. 归经:归心、肝、胃、大肠、膀胱经。 Meridian: heart, liver, stomach, large intestine, bladder. 功效:清热燥湿，杀虫，利尿。 Effect: heat and dampness, insecticide, diuretic. 主治:用于热痢，便血，黄疸尿闭，赤白带下，阴肿阴痒，湿疹，湿疮，皮肤瘙痒，疥癣麻风。 Indications: for heat dysentery, bloody diarrhea, jaundice, urine retention, vaginal discharge, vaginal swelling Yin Yang, eczema, eczema, itchy skin, scabies leprosy. 土茯苓，性味:甘淡，平。  Smilax, taste: sweet light, flat. 归经:归肝、胃、脾经。 Meridian: liver, stomach, spleen. 功能:解毒，除湿，利关节。 Functions: detoxification, dehumidification, the joint profits. 主治:治梅毒，淋浊，筋骨挛痛，脚气，疗疔疮，痈肿，瘰疬，梅毒及汞中毒所致的肢体拘挛，筋骨疼痛。 Indications: treatment of syphilis, pouring muddy, bones twin pain, athlete's foot, treatment of boils, carbuncles, scrofula, syphilis and mercury poisoning caused by limb Spasm, aching pain. 地肤子，性味:辛，苦，寒。  Kochia scoparia, taste: suberic, bitter cold. 归经:归肾、膀胱经。 Meridian: kidney, bladder. 功效:清热利湿，祛风止痒。 Effect: heat and dampness, chills and itching. 主治:用于小便涩痛，阴痒带下，风疹，湿疹，皮肤瘙痒。 Indications: For painful urination, vaginal discharge Yin Yang, urticaria, eczema, itchy skin. 紫草，性味:甘，咸，寒。  comfrey, taste: sweet, salty, cold. 归经:归心、肝经。 Meridian: heart, liver. 功效:凉血，活血，解毒透疹。 Efficacy: cooling blood, blood circulation, detoxification Touzhen. 主治:用于血热毒盛，班疹紫黑，麻疹不透，疮疡，湿疹，水火烫伤。 Indications: for blood heat poison Sheng, class rash Zihei, measles impervious, sores, eczema, water and fire burns. 本发明治疗特应性皮炎和夏季皮炎的中药湿巾符合中医关于皮炎的理论。  The present invention is the treatment of dermatitis and atopic dermatitis summer wipes consistent with theoretical medicine TCM on dermatitis. 针对上述在治疗特应性皮炎和夏季皮炎过程中的缺陷，本产品在总结前人经验的基础上，历经多年临床研究，采用纯天然草本中药独特配方和工艺精制而成。 In response to these defects in the treatment of atopic dermatitis and dermatitis during the summer, this product based on previous experience, after years of clinical research, a unique formula and process natural herbal medicine refined. 本品内含丰富的植物生物活性成分，可直接作用于患处。 This product contains a wealth of plant bioactive ingredients, it can act directly on the affected area. 并且具有无痛苦、易接受、疗效显著、不易过敏的特点。 And it has no pain, easy to accept significant effect, hypoallergenic characteristics. 组方分析:黄柏具有清热解毒，清热燥湿之功效，为君药；金银花清热解毒，凉散风热，为臣药；苦参、土茯苓、地肤子、紫草并为佐使加强本方清热解毒利湿止痒的功效。 Prescription Analysis: Cork has the effect of detoxification, heat dampness, the King and medicine; honeysuckle detoxify, cool wind-heat powder, Chen medicine; Sophora, soil Fuling, belvedere fruit, comfrey and strengthen the Satsukai detoxification dampness itching side effect. 下面结合实施例和实验例详细说明本发明的技术方案，但保护范围不被此限制。  The following Examples and Experimental Examples illustrate the technical details of the present invention, but the scope is not so limited. 地肤子10份 紫草10份。  10 parts 10 parts Fructus comfrey. 所述的中药湿巾的制备方法，与实施例基本相同，但用水量是原料总重的26倍。  The Chinese medicinal preparation wipes, substantially the same as the embodiment, but the water is 26 times the total weight of the feedstock. 地肤子15份 紫草15份。  15 parts of Fructus comfrey 15 parts. 制备方法基本上与实施例1相同，但用水量是原料总重的28倍。  A method for substantially the same as in Example 1, but the water is 28 times the total weight of the feedstock. 地肤子40份 紫草40份。  40 parts 40 parts Fructus comfrey. 制备方法基本上与实施例1相同，但浸泡的时间是50分钟。  A method for substantially the same as in Example 1, but the soaking time is 50 minutes. 地肤子20份 紫草20份。  20 parts Fructus comfrey 20 parts. 制备方法基本上与实施例1相同，但保持微沸状态煎煮的时间是35分钟。  A method for substantially the same as in Example 1, but maintaining the state of micro-boiling boiling time is 35 minutes. 地肤子30g 紫草30g。  comfrey Fructus 30g 30g. 制备方法,是将各原料洗净混合，添加原料重量27倍的水,浸泡60min,用武火煮开锅，改用文火，保持微沸状态煎煮30分钟。 Preparation of  methods, mixing the raw material is washed, 27 times the weight of the material was added water, soaking 60min, the use of force Simmer boil, switch to a slow boil state remains boiling for 30 minutes. 本发明中药湿巾的最佳适用年龄:0-14岁的幼儿或儿童，具有无痛苦，易接受，疗效显著，不易过敏等特点。  For ages the best medicine wipes of the present invention: 0-14-year-old toddler, or child, have no pain, easy to accept, a significant effect, hypoallergenic and so on. 适应症主要有:特应性皮炎和夏季皮炎。 Indications are: atopic dermatitis and summer dermatitis. 疗程:每天晚上用本湿巾擦拭患处(病情严重者用本湿巾先帖敷患处10分钟)，1-5次显效，7天为一个疗程。 Treatment: every night present wipes wiping the affected area (a serious condition with a post apply the nozzle of the present wipes to 10 minutes), markedly 1-5 times, 7 days a course of treatment. 临床病理1:王先生，26岁，女儿(6个月)于2011年6月开始，面部及四肢皮肤上易瘙痒，起先采用皮质类固醇激素外擦后症状减轻，停药后复发。  Clinical Pathology 1: Mr. Wang, 26-year-old daughter (6 months) in June 2011 to start, easy to itching on the skin of the face and limbs, at first using the pheromone rub corticosteroids to alleviate the symptoms, relapse after drug withdrawal. 后来我处就诊，使用本发明中药湿巾，每晚睡前擦拭患处，5天后症状消失。 I later at the clinic, the present invention is the use of traditional Chinese medicine wipes, wipe the affected area every night before going to bed five days after the symptoms disappear. 临床病例2，朱女士，32岁，他5岁的儿子面颊、额部起初只有红斑，后来开始发痒脱皮，伴有抓痕。  2 clinical cases, Ms. Zhu, 32 years old, his 5-year-old son, cheeks, forehead at first only erythema, peeling and later started to itch, accompanied by scratches. 让其儿子使用本湿巾，睡前使用本发明中药湿巾直接擦拭患处。 Son allowed to use the wipes, wipes medicine bedtime present invention is directed wiping the affected area. 3天后症状好转，一个疗程以后彻底治愈。 3 days after the symptoms improved after a course of treatment to completely cure. 临床病例3，孙某，男，7岁，淄博人，从5岁就开始每当入夏时，额头、面颊、腋窝周围皮肤潮红，小斑丘疹上渗出淡黄色脂性液体覆盖在皮疹上，以后结成较厚的黄色痂皮，不易除去，但痒感不太明显。  Clinical Case 3, Sohn, male, 7 years old, Zibo, beginning from the age of five each time summer, bleeding as a pale yellow liquid fat on the forehead, cheeks, around the axillary skin flushing, rash covering the small the rash after form a thick yellow crusts, difficult to remove, but less pronounced itching. 于2011年7月份来我处就诊，让他使用了一个疗程的本发明中药湿巾，嘱其在睡前使用本湿巾帖敷患处10分钟，5天后红斑消失，继续使用本湿巾一个疗程，以作巩固，至今未复发。 In July 2011 visit to my office, so he used a course of medicine wipes the invention, Nursing and use the wipes posts at bedtime wrap the affected area for 10 minutes, five days after the disappearance of erythema, a course of continued use of the wipes in order for the consolidation, has not recurred. 试验例(实施例6所得药物): 根据卫生部1993年制定的《中药新药临床研究指导原则》为诊断依据，共200例年龄在0-14岁之间患有脂溢性小儿湿疹的儿童患者，其中，男孩104人，女孩96人，平均年龄为6.5岁。  Test Example (Example 6 resulting drug cases):  According to "Chinese new drug clinical research guidelines," the Ministry of Health enacted in 1993 as a basis for the diagnosis, a total of 200 patients aged between 0-14 years of age suffering from seborrheic children with eczema in children, where boys and 104 girls 96 people, average age of 6.5 years. 随机划分为给药组和对照组。 Randomly divided into the treatment group and the control group. 疗效分析:给药组(本发明中药湿巾)使用3天时大多数病人感觉症状明显减轻，皮肤红斑减少，瘙痒感不再强烈，用药5天时病人基本痊愈，皮肤红斑消失，感觉不到瘙痒的存在。  Efficacy Analysis: administration group (TCM wipes of the present invention) using 3 days to alleviate symptoms in most patients feel and reduce skin redness, itching not strong, basic patient medication 5 days recovery, skin erythema disappeared, feeling the presence of itching. 停药一段时间未见反复，病情得到较好控制。 No withdrawal period is repeated, to obtain better control of the disease. 对照组服药后治愈效果明显，但是停药后90%的患者又复发。 The control group after taking the cure effect is obvious, but after stopping 90% of patients relapse. 本申请的组方为名老中医验方，并经过了聊城大学、聊城市中医医院专家学者的论证，具有产业化实施的前景。 Prescription  The present application in the name of the old Chinese medicine prescription, and after Liaocheng University, Liaocheng experts and scholars of Chinese medicine hospitals demonstration, promising industrial implementation. 本申请的发明人是山东政法学院员工(主讲发明创造学)，该发明的完成得益于山东省十二五规划重点学科——经济法学学科资金的支持。 The inventor of this application is the Shandong University of Political staff (Speaker inventions school), thanks to the completion of the invention Shandong Province Twelfth Five-Year Plan key disciplines - disciplines funds to support the economic law. 应当指出的是，具体实施方式只是本发明比较有代表性的例子，显然本发明的技术方案不限于上述实施例，还可以有很多变形。  It should be noted that the specific embodiments are merely examples of the present invention are more representative aspect of the present invention is clearly not limited to the above-described embodiments, can also have many variations. 本领域的普通技术人员，以本发明所明确公开的或根据文件的书面描述毫无异议的得到的，均应认为是本专利所要保护的范围。 Those of ordinary skill in the art, the present invention is specifically disclosed in accordance with the written description or file no objection obtained, it shall be considered to be the scope of the patent to be protected. 1.一种清热解毒利湿止痒的中药湿巾的制备方法，其特征在于:取下述重量配比的原料: 黄柏40~80份苦参10~50份金银花15~45份土茯苓20~40份地肤子10~50份紫草10~50份将各原料洗净混合，添加原料重量26-28倍的水，浸泡50-70min，用武火煮开锅，改用文火，保持微沸状态煎煮20-40分钟，滤渣，将消毒无纺布置滤液中，浸溃，得成品湿巾。 Chinese medicinal preparation wipes 1. A detoxification dampness itching, characterized in that: the raw material taken following weight ratio: 40 to 80 parts by Cork flavescens 10 to 50 parts to 45 parts of honeysuckle 15 20 Smilax 10 to 40 parts to 50 parts Fructus Lithospermum 10 to 50 parts the washed material mixed, 26-28 times the weight of raw water, soaking 50-70min, the use of force Simmer boil, switch to a slow holding micro-boiling 20-40 minutes boiling state, residue, filtrate disinfecting nonwoven fabric set, dipping to obtain finished wipes. 2.根据权利要求1所述的制备方法，其特征在于: 黄柏45~75份苦参15~45份金银花20~40份土茯苓25~35份地肤子15~45份紫草15~45份。 The production method according to claim 1, wherein: Cork 45 to 75 parts to 45 parts of honeysuckle Sophora 15 20 to 40 25 to 35 parts Smilax Fructus 15 parts to 45 parts to 45 Zicao 15 copies. 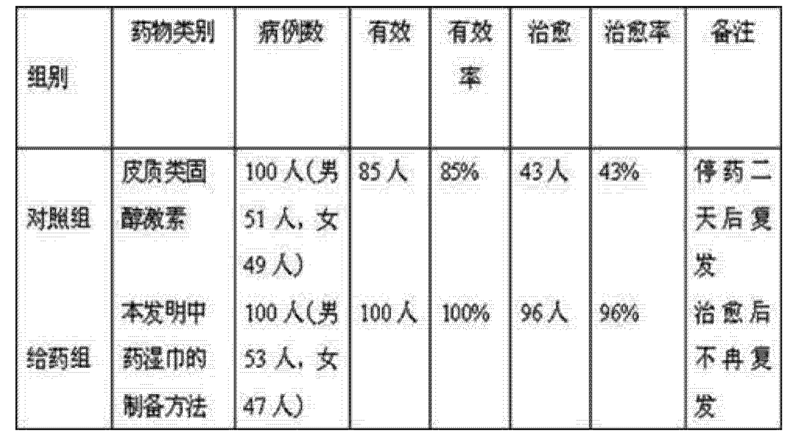 3.根据权利要求1所述的制备方法，其特征在于: 黄柏50~70份苦参20~40份金银花25~35份土茯苓27~32份地肤子20~40份紫草20~40份。 The production method according to claim 1, wherein: Cork 50 to 70 parts to 40 parts honeysuckle, Sophora 20 25 to 35 27 to 32 parts Smilax parts Fructus 20 to 40 20 to 40 parts by comfrey copies. 4.根据权利要求1所述的中药湿巾的制备方法，其特征在于: 黄柏60份苦参30份金银花30份土茯苓30份地肤子30份紫草30份。 The production method according to claim 1 wipes medicine, wherein: Cork honeysuckle parts 60 parts 30 parts 30 flavescens Smilax 30 parts 30 parts Fructus Lithospermum 30 parts. 5.根据权利要求1所述的制备方法，其特征在于:用水量是原料总重的27倍。 The production method according to claim 1, wherein: water is 27 times the total weight of the feedstock. 6.根据权利要求1所述的制备方法，其特征在于，浸泡的时间是60分钟。 6. The production method according to claim 1, characterized in that the soaking time is 60 minutes. 7.根据权利要求1所述的制备方法，其特征在于，保持微沸状态煎煮的时间是25-35分钟。 7. The production method according to claim 1, characterized in that the micro-boiling state holding time is 25-35 minutes of boiling. 8.根据权利要求7所述的制备方法，其特征在于，时间是30分钟。 8. The production method according to claim 7, wherein the time is 30 minutes. 9.根据权利要求1所述的制备方法，其特征在于，所述湿巾规格为18.5cmX18.5cm。 9. The production method according to claim 1, characterized in that, the specifications for wipes 18.5cmX18.5cm. Owner name: NANTONG WEEK TOURISM DEVELOPMENT CO., LTD.